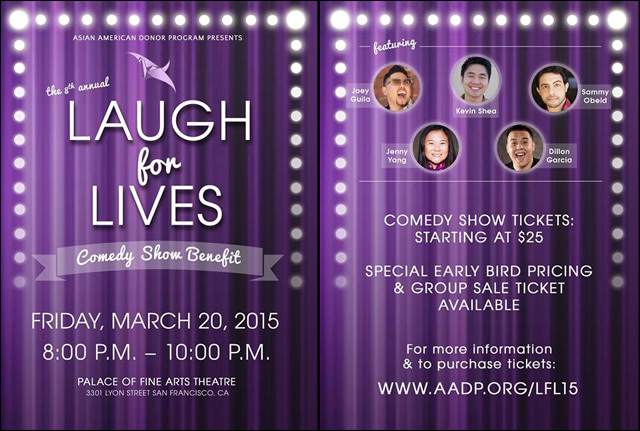 Laugh for Lives is a comedy show benefiting Asian American Donor Program, a non-profit organization dedicated to increasing the availability of potential stem cells donors for patients with life threatening diseases curable by a stem cell transplant. Ethnic minority individuals are desperately needed to register as a potential bone marrow/stem cell donor. Because finding a matching donor is often based on ethnicity, and because there are so few Asian American and Pacific Islander donors listed on the National Registry, many patients are not able to find a perfect matching donor. AADP’s goal is to register more ethnic minority donors and give patients a greater chance of finding a perfect match early on in their diagnosis. It costs $100 to add one (1) new donor onto the Registry. We need your help to continue our cause so no donor is asked to pay to join the registry.